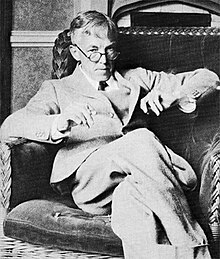 Geff Harold Hardy FRS (7 February 1877 Cranleigh, Surrey – 1 December 1947 Cambridge, Cambridgeshire) was a famous English mathematician. He investigated number theory and mathematical analysis. Hardy's classic text A course of pure mathematics was first published in 1908 and has been in print ever since. He wrote A Mathematician's Apology in 1940. In 1908, unable to explain how a dominant gene would not become ubiquitous in a population, Reginald Punnett introduced his problem to Hardy, with whom he played cricket. Hardy went on to formulate what became known as the Hardy–Weinberg law. "There are infinitely many primes p such that p+2 is also prime". Hardy discovered the Indian mathematician Srinivasa Ramanujan, who was a brilliant student. Hardy saw his extraordinary intelligence and they worked together on many mathematical subjects. In an interview given to Paul Erdős, Hardy said that the discovery of Ramanujan was his (Hardy's) greatest contribution to mathematics and that their collaboration was "the one romantic incident in my life". ↑ G.H. Hardy, A Mathematician's Apology, Cambridge University Press (1940). 153 pages. ISBN 0-521-42706-1. ↑ Hardy G.H. (1908). "Mendelian proportions in a mixed population". Science. 28 (706): 49–50. doi:10.1126/science.28.706.49. ISSN 0036-8075. PMID 17779291. ↑ Edwards A.W.F. 2008. G.H. Hardy (1908) and Hardy–Weinberg Equilibrium. Genetics, 179, 1143–1150. This page was last changed on 24 October 2018, at 18:59.